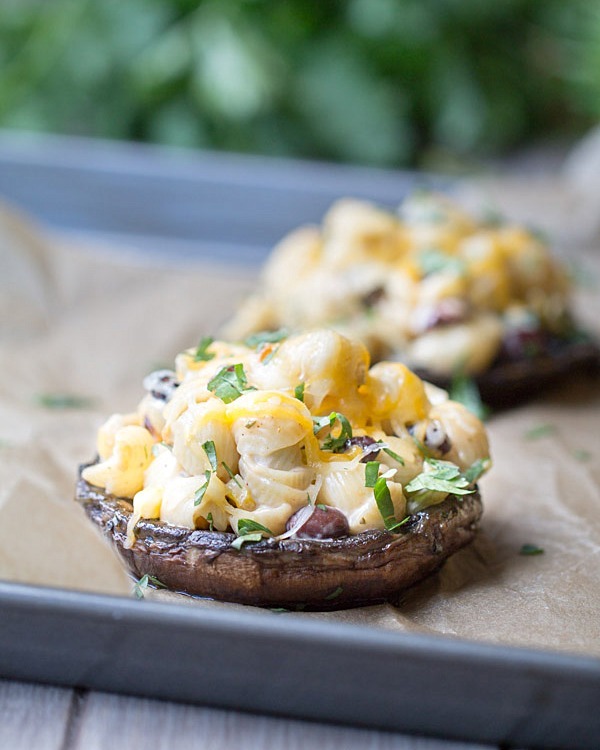 If you’re looking for an easy pasta salad recipe, try these Southwest Pasta Salad Stuffed Mushrooms. They make for one fantastic meatless main dish that’s on the table in 30 minutes! Serve slightly warm and topped with melted cheese! Isn’t it funny how our tastebuds change over the years? When I was a kid, I loved mushrooms. I mean I totally LOVED them. I loved them so much that I would eat them raw. Then I gradually grew out of my love for mushrooms and by the time I was starting high school, I hated them. I hated them with a passion. I couldn’t even eat anything that a mushroom had touched because I could still taste that mushroom flavor. Ordering a works pizza without mushrooms was a must because picking them off the pizza just wasn’t acceptable to me. But then fast forward to oh, the year 2006. It was the year that I met Ken. We went on a date to an Italian restaurant and he encouraged me to try a dish with mushrooms. I don’t know if I was trying to impress him or what but I decided to jump out of my food comfort zone and order a mushroom dish. I can’t remember exactly what it was that I ordered. It was a creamy pasta dish with chicken and mushrooms. It was from Romano’s Macaroni Grill so if you know the dish I’m speaking of, let me know below! It was good! This dish caused me to become a mushroom lover again. And it kinda turned me into a stuffed mushroom crazy woman. Not really. But I totally love stuffed mushrooms and can eat them the same way I can eat cookies – one right after the other. Except that I don’t feel as guilty when eating stuffed mushrooms. 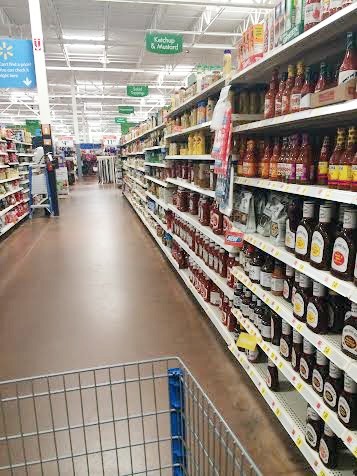 A couple weeks ago, while shopping at Wal-Mart, I came across Kraft Pourables Classic Ranch Dressing. Seriously, the new Kraft Pourables have been reinvented with a new, better taste! 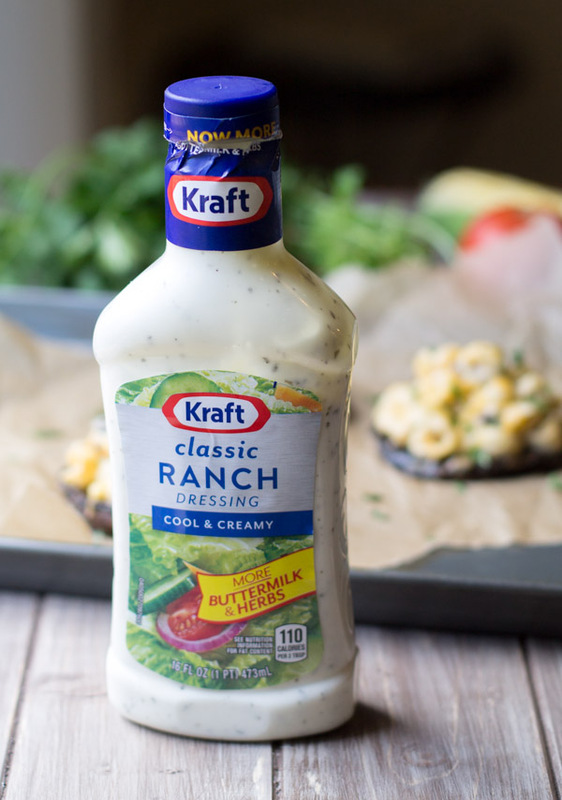 The Classic Ranch is now creamier, with more buttermilk and savory herbs! I picked up a bottle and thought about making either an easy skillet meal or a pasta salad recipe with it. Because, you know, #FoodDeservesDelicious ingredients. I opted for the pasta salad recipe because it is easier to make and only requires me to use my oven for about 5 minutes. I try to use my oven as little as possible during the summer time. I wanted to kick up the creativity with my pasta salad so I decided to stuff some of it into portobello mushroom caps. Best idea ever! Portobellos are a great alternative to meat and considering that I’m trying to quit eating meat, I figured they would be a great accompaniment to the pasta salad. 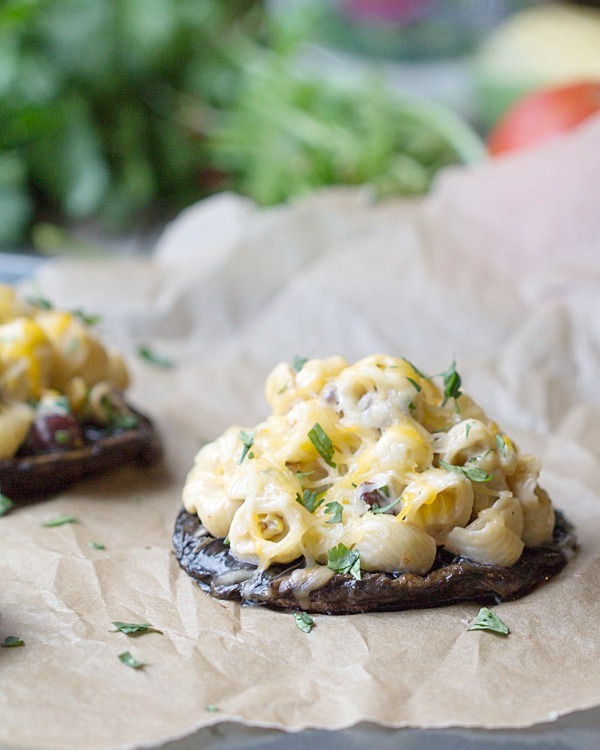 These Southwest Pasta Salad Stuffed Mushrooms are basically side dish meets main dish. You have the meaty mushroom paired with the delicate pasta salad. It’s easy to make this salad and you can alway prep the salad the day before you intend to make the mushrooms. Prepping ahead of time makes for easy weeknight meals. This recipe calls for charred corn. You can easily char your corn on a grill, in a skillet or by using your broiler. The only other thing you’ll need to cook are your mushrooms. I cooked mine on a skillet. Once your done with the corn and the mushrooms, you’ll toss your sauce together, throw in the veggies and cheese, mix well and then stuff those mushroom caps! You’re definitely going to have leftover pasta salad but who doesn’t love having leftover pasta salad laying around, waiting to be devoured? Enjoy the recipe! Cook the mushrooms: In a skillet over medium heat, heat the olive oil and 2 tsp of chives. Add the mushrooms, stems facing up, and cook for 3-4 minutes. Flip and cook for 3-4 more minutes. Remove from the skillet and set aside. Prepare the pasta salad: in a mixing bowl, whisk together the ranch dressing and chipotle adobo sauce. Add the diced green chilis, remaining chives, black beans and charred corn. Place the pasta in a large bowl and then pour the sauce and veggies over top. Mix in the shredded cheese. Assemble the mushrooms: Preheat your oven to 325. Line a baking sheet with parchment paper and place the mushrooms on the sheet. Top with about ½ C of the pasta mixture and then sprinkle with cheese. Place in the oven until the cheese is just melted, about 5 minutes. Remove from the oven and sprinkle with cilantro. Store any remaining pasta salad in your fridge for up to 5 days. You can make more than 3 stuffed mushrooms. You could probably do 6-8 and still have some pasta salad leftover. That's the beauty of this recipe! So timely, I had portobellos last night and made note that I need to make them more often! Pinned and making! Thanks Julie! What a great idea!!! I love mushrooms and always always find ways of having the boy eat it more. This pasta salad looks amazing. I am completely dying over here. Seriously. Um, ok I love mushrooms and pasta. 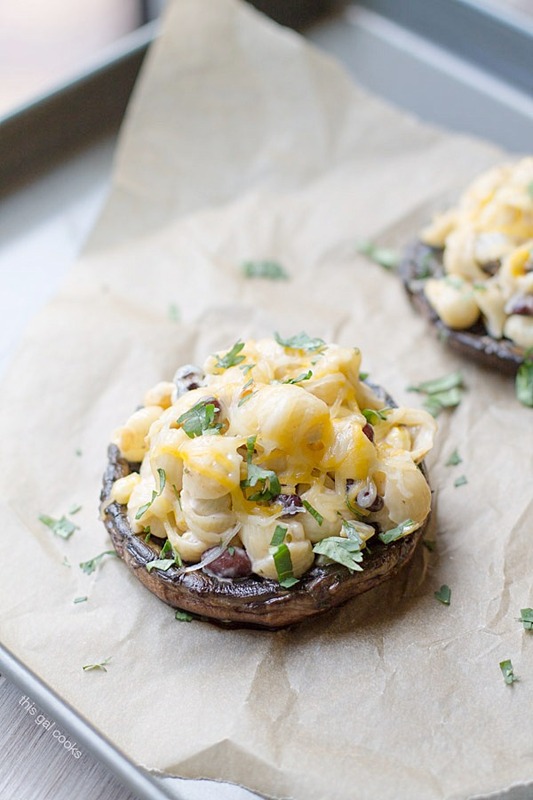 I love stuffed mushrooms and these are stuffed with pasta. And topped with cheese. See these things determine my fate every day. I see this? I am having stuffed mushrooms for dinner. Yes, I may be that shallow. Yeah! So glad you like this recipe, Claire! 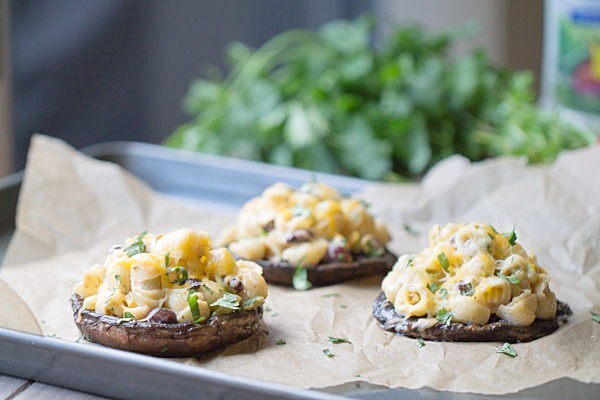 So now you gotta go make stuffed mushrooms with pasta and have one groovy dinner. :) Thanks so much for stopping by! I’ve been hoping that my tastebuds would change over the years. I HATE mushrooms. It is really the only thing I won’t eat. I’ve always hated them and know that so many people love them so they must be good, right? It is the texture that I don’t like. Even though I don’t like mushrooms, I would probably scoop out all of that creamy pasta because these look incredible! The pasta is definitely great and you don’t even need the mushrooms to enjoy it. :) I’m so weird about textures but surprisingly, the texture of mushrooms have never bothered me. It was always the taste. This is a new one for me with the pasta in the mushroom. I am enchanted. Something totally different. Who needs meat! 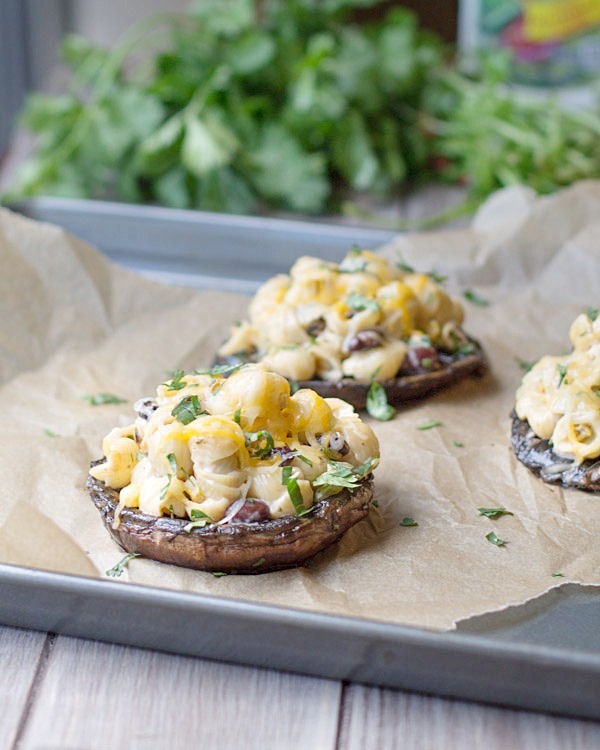 I love mushroom anything (almost anything), and this looks delicious, Julie! Portobellos are the best! Such a smart idea!!! Love it! What a great flavor combo Julie! I do love mushrooms and just tried my first morel last year and can now see why those are so popular! Pinned! 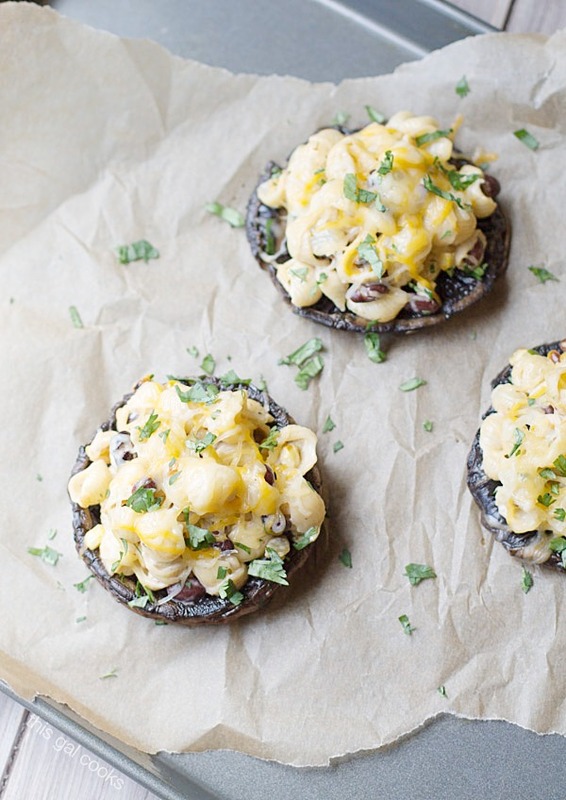 Julie, what a great idea to stuff mushrooms with pasta salad – love it and such a great, fresh idea for summer! It looks amazing! Pinning! Hope you have a wonderful Tuesday! Ohh I love that these are in little mushroom cups :) Looks delish. 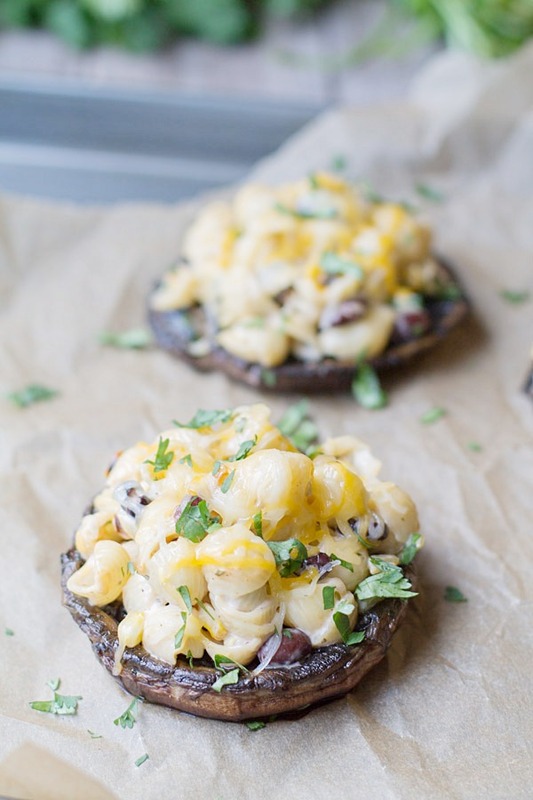 This is such a creative and tasty take on stuffed mushrooms! :) Love this, Julie!